CT Junior Republic: Why Support CJR? Since 1904, thousands of youth have been helped by the Connecticut Junior Republic (CJR). With the generous involvement of many friends and contributors, CJR gives at-risk, special needs, and troubled boys, girls and families the assistance they need to overcome a variety of challenges, including learning disabilities, emotional, behavioral and family issues, neglect, abuse, domestic violence, and substance abuse. 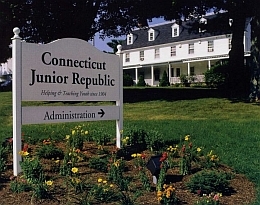 Contributions and grants from individuals, businesses and foundations help the Connecticut Junior Republic provide services which address these issues in locations throughout Connecticut. Bequests to CJR Fund, Inc., help support the growth of CJR's endowment, which generates critical income for program support and development. This vital reserve also enables the Junior Republic to reach out to children and their families by providing innovative new services and more comprehensive care. Generous annual and major gift contributions, as well as planned gifts, help ensure that CJR can meet the growing and increasingly complex needs of at-risk, special needs and troubled boys and girls and their families. CJR adheres to the Association of Fundraising Professionals' AFP Code of Ethical Standards and to the Donor Bill of Rights to ensure that the general public, donors and prospective donors have full confidence in supporting the Connecticut Junior Republic. Connecticut Junior Republic/CJR Fund, Inc.